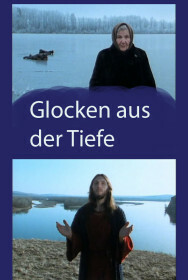 Bells from the Deep is German director Werner Herzog's documentary investigation of Russian mysticism. The first half of the film is concerned primarily with a Russian faith healer and a man claiming to be the reincarnation of God as was Jesus. Herzog uses primarily interviews with Russians and scenes from the religious services of the two Holy men. Herzog also has several segments on the religion of Siberian nomads. The second half of the film is primarily concerned with the legend of the lost city of Kitezh. This myth is about a city that was in peril of being destroyed by marauding Mongols, but whose citizens prayed for rescue. Hearing their prayers, God placed the city at the bottom of a deep lake, where it resides to this day. Some even say that one can hear the bells from the city's church. The story is recounted by a local priest and pilgrims visiting the lake. Throughout the movie a character claiming to be the second coming of Jesus appears. Towards the very end of the film he blesses the viewers of the film. This man is Sergey Anatolyevitch Torop who has later received much attention as the religious leader Vissarion.